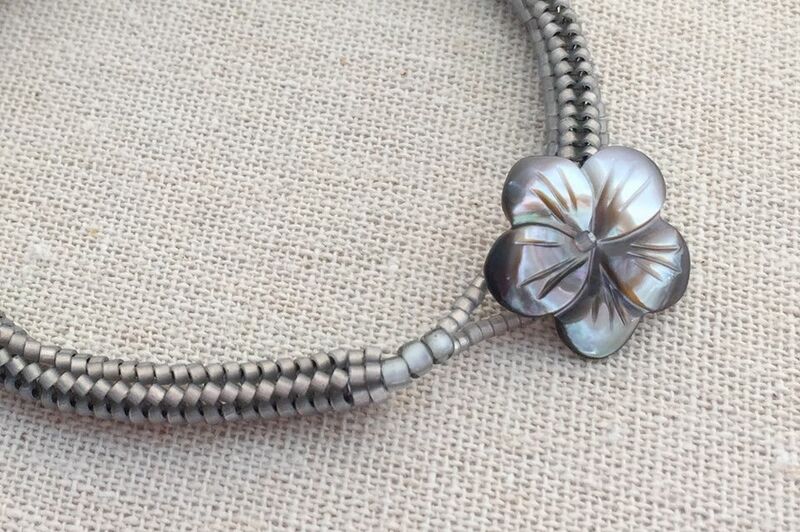 Beaded clasps add a great custom look to all of your beaded creations. These clasps are similar to a toggle clasp, where a pretty button or special bead is used in place of the toggle, and a beaded loop is used for the ring half of the toggle. The best thing about making your toggle clasp is knowing that you can make it match the colors and overall style of your beadwork. That can be more difficult to find the common types of jewelry clasps purchased in stores. Use a stronger thread like FireLine or WildFire when making bead and loop clasps for added security. To act as a toggle, you will need a bead or button that is large enough to wrap a loop around and keep it in place. The bead pictured is only 9 mm long with a 7mm diameter, but the barrel shape has enough of a lip to help keep the loop in place. Having a bead with a larger diameter would mean that you also need a larger loop to slip over the bead, so you need to keep the proportion and scale of your jewelry project in mind when selecting a button or bead. Any button can be used, including those with two holes, four holes or shank buttons. To use a bead, add a few beads to the end of your project to give room for the loop to stay on, add the decorative bead, and then another bead to hold it in place. Stitch back through the decorative bead, skipping the end bead, and back through the first few beads you added. Reinforce these stitches several times. Using a button would be similar. Add enough beads to separate the button from the bracelet, go through the shank in the button and add more beads to make a loop around the button shank. You may choose to stitch back through some of the original beads added to keep the loop around the bead shank small and hold the bead firmly in place. Using a button with holes is similar, but you will want to add a bead or two to the face of the bead before stitching back through the hole to keep the thread covered. The most critical step of a bead and loop clasp is making sure the loop is the correct size! It needs to be just large enough to slide over the bead or button easily, but small enough so it cannot slip out on its own. There is only one way to get it right, and that is by testing it out. Add a couple of beads to the end of your project to move the loop a little bit away from the end. This makes it more flexible and easy to get to. Pick up as many beads as you think will fit over your bead and make them into a loop by stitching back through the base bead. Without permanently stitching anything, pinch the loop tight and try slipping it over the bead. Make sure it is easy to slip over but fits close. Make sure there is enough of a lip for the loop to stay in place under the bead. You may have to remove or add beads based on your findings. Once you have found the right size, secure the loop in place by stitching through the beads as many times as necessary. Always reinforce loop clasps since they get a lot of use and may get pulled on if the jewelry ever gets caught on something. For wider bracelets or cuffs, you may want to consider adding more than one bead or button for a more secure closure. Enjoy your new bracelet. If you are interested in making a bracelet like the one in the pictures follow the instructions to create a tubular herringbone stitch bracelet. This bracelet was designed to accentuate the colors of the bead in the clasp. Here is another example of adding a button and loop clasp to a peyote bracelet.